NASA is investing in robots that do away with hard metal chassis and instead navigate by rapidly inflating and deflating air-filled sacs. 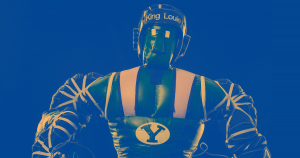 Scientists from Brigham Young University teamed up with the startup Pneubotics to build an inflatable robot named King Louie, according to IEEE Spectrum. The robot looks sort of like a Rock ‘Em Sock ‘Em Robot crossbred with a Bobo Doll — but its slightly unnerving appearance could be worth the benefits that NASA expects inflatable bots to bring to space missions. Inflatable robots could serve as a lightweight, space-efficient alternative to metallic robots or robotic arms on NASA’s rovers, shuttles, or space stations, IEEE Spectrum reports. But there are still some hurdles to overcome, most notably the fact that the floppy robots find themselves in slightly different orientations each time they’re deflated and blown up again. Those slight differences can make it difficult to program the robot’s limbs as one would a metal robot. But the Brigham Young scientists found a way to guide and train the robot’s movements so that it learns how high or far to reach no matter the slight variations caused by being inflated. King Louie isn’t ready for blastoff quite yet, but as it gets better at controlling its bulk, astronauts may soon get a floppy, air-filled helping hand.